Ubisoft has announced that they are expanding Hasbro’s board games repetoire on the Nintendo Switch. RISK and Trivial Pursuit Live! will be joining the already released Monopoly onto the system on October 30th. Both new titles will be available to purchase digitally or they can be purchased together as part of the newly announced Hasbro Game Night bundle which, will also include Monopoly. Both RISK and Trivia Pursuit Live! will come with new, exclusive features. An official statement has been released by Ubisoft which, you can check out below. Nintendo Switch owners looking to scratch a board-game itch will have new options this fall, when the Risk and Trivial Pursuit Live! videogames arrive on the platform as digital downloads with exclusive new features. Both games will also be available as part of the Hasbro Game Night for Nintendo Switch compilation, along with Monopoly for Nintendo Switch, already available as a standalone. Trivial Pursuit Live! lets players compete in teams in Versus Mode and with up to three friends in local multi console, and features 1,800 up-to-date questions (including 650 kid-friendly family questions). Risk, meanwhile, boasts improved pacing and a new top view. Both games feature new graphical, UI, and online enhancements, as well as touchscreen features exclusive to the Nintendo Switch versions. 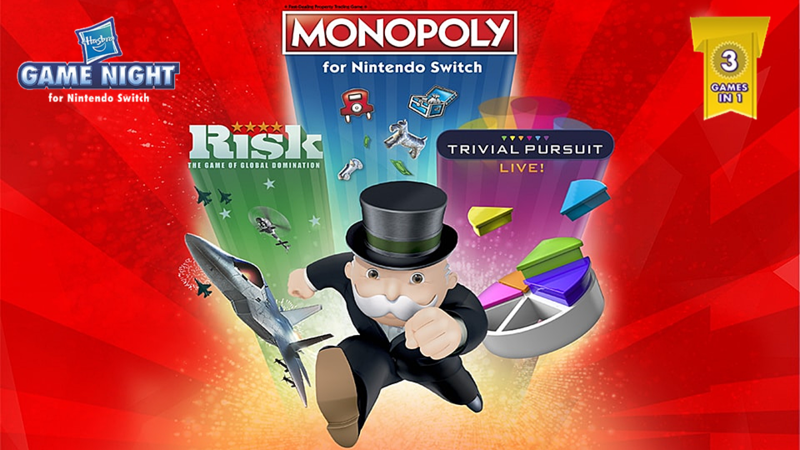 Risk, Trivial Pursuit Live!, and Hasbro Game Night for Nintendo Switch launch on Nintendo Switch on October 30.